The Snarchitect | Technology meets creativity meets culture. And snarky commentary to make it all taste great. Technology meets creativity meets culture. And snarky commentary to make it all taste great. CaaS may soon mean concierge-as-a-service. Japan to open first hotel with robotic staff. In addition to the robot staff, the hotel will be equipped with other advanced technologies, such as the use of facial recognition scanners in lieu of room keys. Temperatures within guests’ rooms will be measured via a sensor that monitors body temperature rather than thermostat, and rooms will be equipped with tablets with which to communicate with the front desk. The robots, meanwhile, will provide a variety of services, according to the company, including room cleaning, front desk and porter services, meaning you could be checked in by robots and have robots carry your bags to your room. The automaton workforce is being supplied by Kokoro Co. Ltd., according to a report in the Telegraph. The company, which is part of the same conglomerate that provides the license for Hello Kitty, is using technology developed at Osaka University. Kokoro has been developing its android models, which it calls “actroids,” since they first debuted in 2003. The robots will have the ability to make eye contact, gesture with their hands, and will speak Japanese, English, Korean and Chinese. + Iwazume is looking a little bit creepy here. It’s come to this: a Buzzfeed-style “listicle” about the Internet of Things. Seventeen “stunning” things you never knew about the IoT. But I bet you actually know at least 12 of them. 1. In 2008, there were already more “things” connected to the Internet than people. By 2020, the amount of Internet-connected things will reach 50 billion, with $19 trillion in profits and cost savings coming from IoT over the next decade, according to Cisco Systems . 2. Knowledge of the Internet of Things is growing slowly. Right now, about half of Americans don’t know that smart thermostats and smart refrigerators are already on the market. 3. With the latest Internet address standard (IPv6), there are enough Internet addresses for every atom on the Earth , according to Cisco. Meaning that companies can build a lot of small devices that connect to the Internet without running out of IP addresses. Rapid advances in digital manufacturing, particularly additive manufacturing, are changing aviation design and testing. Pratt & Whitney already uses two additive manufacturing techniques to make some engine components. Instead of casting metal in a mold, the methods involve forming solid objects by partially melting a metal powder with either a laser or an electron beam. Other aircraft makers use similar technology; GE, for example, creates fuel nozzles for jet engines using its own additive manufacturing techniques. Watching the Postal Service compete with FedEx, it’s wise to remember that USPS has one advantage: a enormous sugar daddy. In the latest year, a $754M sugar daddy. The results of the U.S. Postal Service’s ongoing surrender to e-mail, United Parcel Service Inc. (NYSE: UPS), FedEx Corp. (NYSE: FDX) and its own inefficiency showed again when it posted results for the final quarter of 2014. The organization’s loss rose to $754 million from $354 million in the same period last year. (The net loss included a $1.4 billion expense accrued for the mandated prepayment to the Postal Service Retiree Health Benefits Fund.) The USPS may comfort itself because revenue ticked up 4% to $18.7 billion. Among the things the data support are that the system is too big with too many workers and offices. FedEx manages to alienate the small business customer. Small businesses and entrepreneurs that are using FedEx are finding SmartPost just as terrible as the company’s sales team. Those who use Amazon to sell goods are forced to use FedEx SmartPost, with disastrous results, according to Sam Oh, founder of moneyjournal.com. Surprising to find that one of the more digitally advanced sectors of retail is automotive retail. Yes, car dealers. As I gaze into the next decade, it seems to me that automotive retail outlets are ideally suited to take advantage of the growing interest in car sharing and autonomous cars. As OEMs start to experiment with how they can deliver mobility services, car dealers likely will play a pivotal role. After all, mobility service providers will need a large variety of vehicles in inventory, lots of space to park those vehicles, and plenty of garage stalls to repair and maintain them. And they will need thousands of facilities like this scattered from coast to coast. Anyone come to mind? Car dealers fit the bill perfectly. Maybe this is why long-term investors like Buffet and Soros are investing now. They’re getting in on the ground floor before there even is a ground floor. Historically, car dealers have had an unfortunate reputation as being sleazy or not reputable. But with Big Money, hi-tech and new mobility services converging on this space, car dealers could emerge as the smartest looking people in the room. I almost fell over from a spell of the vapors when I saw this good news, just in time for the spring furniture show in North Carolina. 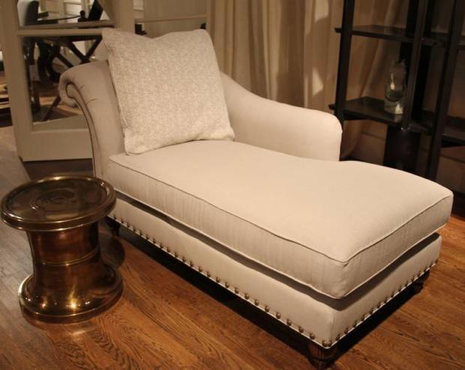 Fainting couch, lounge chair or chaise – whatever you tag it, this elongated chair is showing up once again in homes and showrooms. The chaise, whose origins stretch back to the daybeds of ancient Egypt and Greece, had fallen out of favor. But new looks are making it more appealing to today’s furniture buyers. + And what’s a “social couch” anyway? Geeks of a certain age have watched the sad, slow, lingering death of RadioShack with dismay and wistfulness. It didn’t have to be this way. There are still potential RadioShack customers out there. Some need HDMI cables and aren’t willing to wait for a delivery from Amazon; others have a professional need for a disposable cell phone. And then there are the tinkerers, who once served as RadioShack’s core constituency. They’re back and thriving and now known as the maker community. And now we see, guess who, picking the bones of RadioShack in search of brick and mortar. Going to do a bit of showrooming, it seems. Amazon.com Inc., aiming to bolster its brick-and-mortar operations, has discussed acquiring some RadioShack Corp. locations after the electronics chain files for bankruptcy, two people with knowledge of the matter said. Amazon has considered using the RadioShack stores as showcases for the Seattle-based company’s hardware, as well as potential pickup and drop-off centers for online customers, said one of the people, who asked not to be named because the deliberations are private. The future of wearables is not a smart watch or a dorky pair of glasses. You won’t have just one wearable—you’ll have dozens. The biggest mistake everyone makes is assuming we’re going to wear the same one all the time. That’s because, traditionally, wearables have done bits and pieces of what our phones already do. Aside from tracking movements, what are these bands and glasses besides proxy screens for our phones? Well, wearables are about to explode into an array of novel, single-function devices. They will suit discrete situations rather than peeling off multiple functions from your phone—it’s use-case engineering. Think of activity-specific clothing, like Hexoskin, that monitors workouts. Or medical devices like Vital Connect, a patch that tracks your vital signs and lets doctors access the data. Or earbuds that aren’t quite hearing aids but which you can wear when there’s too much background noise. Used to be, we told organizations to fight to eliminate “shadow IT” spend, and control it all within the IT function. Now, CIOs need to embrace it and manage it. In order to prevent shadow IT from becoming a problem, or even occurring full stop, businesses need to consider ways to make corporate IT systems not only flexible and easy for staff to use, but also visually appealing and fun in a number of areas. Amazingly, many large enterprises are still using siloed legacy systems that hamper communication across the business and restrict employees in what they can do with the technology available to them. Instead, all businesses should be paying close attention to social functionality when reviewing their IT systems. Innovation in this area can be used to create user interfaces that are similar to employees’ favourite consumer websites, and can often lead to new ways of communicating across the business. Breaking down barriers between different areas of a business in this way can have a positive impact on performance, not only for individual employees but also for the business as a whole.